The Dollar Photo Club, which will be closed soon, is a dedicated stock agency that exclusively offers high quality images for creative professionals. 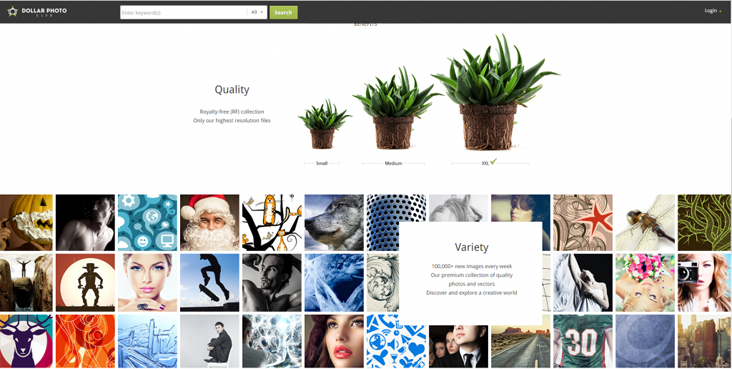 It is curated by the largest stock photo marketplace in the world – Fotolia. The stock site provides unique access to over 25 million images that are organized in various categories. Members of the website can enjoy unlimited downloads stock images for just $1 each. Join today and get straightforward access to the very best images. The Dollar Photo Club recommends some of its best-selling royalty-free photos from the category. Images of meadows, beaches and cities top the category. If you are looking for beautiful sceneries, this is the page for you. Enhance your message and blog site by making your viewers see and feel what it’s like to visit places with amazing landscapes. Another top category is Architecture, where you can get inspiration from beautiful designs and plans of building and constructions. The photo of the Golden Gate Bridge is eye candy. Show your viewers places they only read about by incorporating images of the best structural designs around the world. From the people category, you can see generic to unique images of people including their interaction with other people, things and animals. You will find images of men, women, children and adults in various moods and movements. Feel free to choose whichever fits you creative needs. Some of the best images capture the precious moments of weddings, graduations, friendship and family. If your blog or website’s theme is about plants and animals, this is the category for you. You can download beautiful images of flowers, dogs, trees, birds and other living creatures. The section is filled with colors of nature that will surely spice up your design. This category gives you unique access to images of objects found in different environments, such as home, office, outdoor and many more. Some of the best-selling images include things used in Science, Technology and Sports. This is easily everyone’s favorite. In this category, you will find images of different forms of transportation. Take your readers to places with images of cars, airplanes and trains. You can also take them to explore the universe with images of rockets. From vintage to modern and simple to complicated, different images of transportation can take your design from dull to fun. Other top categories include food & drink, sports & leisure, backgrounds & texture, and abstract. You can check out each of them to find the stock images that fit your creative needs. From the category section, click the image you like and download with your preferred license. The best thing about the category section is you can filter your results to latest uploads, relevance, popularity, undiscovered images, and most downloads.